The Santa Claus Parade is a 100 year-old tradition to put smiles on the faces of kids and families all across the city. The Santa Claus Parade is the longest running children’s parade and one of the overall largest parades in the world. 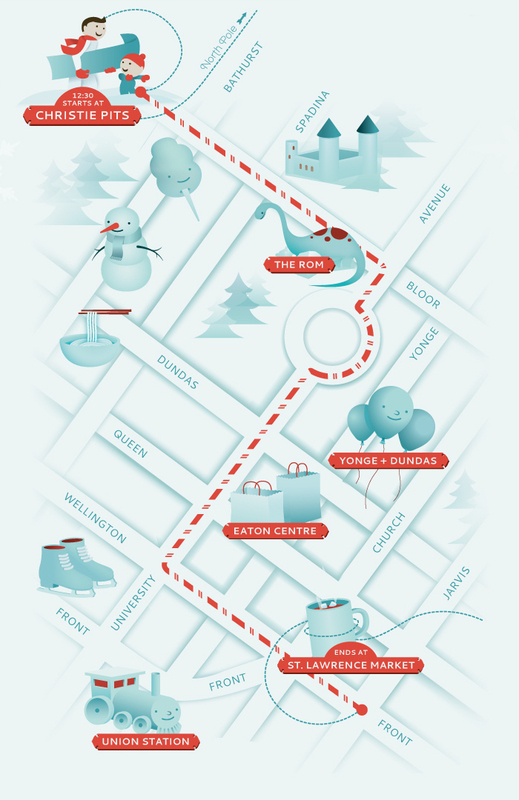 Don`t miss the Santa Claus Parade in Toronto on November 18th. It starts at 12:30 PM at Christie Pitts (Bloor and Christie). More than 30 floats and 25 bands are waiting for you! Be sure to arrive early to have a good spot to see the parade. It is also a good idea to dress warm – gloves, a scarf and a hat are ‘musts’. Be prepared and bring a hot drink with you. Is it too cold for you but you still want to see the parade? Tune in to CTV and CP24 for their live broadcast on Sunday, November 18, 2012 at 12:30 p.m. local time. Aren’t sure which TTC stop you should choose? TTC stops along the parade route are Christie, Bathurst, Spadina, St. George, Museum, Queen’s Park, St. Patrick, Osgoode, Queen, and King Stations. You can buy a red nose between November 1 – 18, 2012 to show your Christmas spirit and anticipation for $2 in Canadian Tire stores. Proceeds are split between 2 charities, Jumpstart and The Santa Claus Parade. Wear it to the parade! The whole Santa Claus Parade is a not-for-profit organization. Because it has so many volunteers and sponsors each year the parade has been successful since 1905. If you want to help to keep the Santa Claus Parade alive, please make a donation of any amount. You will become a part of the Christmas and parade magic and keep bringing smiles to children’s faces. For more information about the Santa Claus Parade please follow this link to the website or visit the official Facebook page of the parade. And you can see photos of the parade on Monday on our EC Toronto Facebook page!